On a recent Sunday afternoon between spring rainstorms, parking for the Bonneville Shoreline trailhead overflowed onto the street. Less than 24 hours before, rain had flooded the trail. Now, people with dogs, people on mountain bikes, and people out with friends and family formed a stream of constant activity up and down the dirt paths. It’s been a long, wet spring in Salt Lake City—cooler than normal, it seems. The rhubarb in the garden, normally a weed of a plant, is coming in slowly, taking its time. The tulips that wither in the heat have remained perfectly cupped and fresh in the yards along my street. It is a perfect spring, and I should be content. But cloudy days make me sleepy and irritable—and I have yet to hear of any outdoor sport that depends on a good hard rain. Wondering if I was letting my pessimistic attitude get the better of me and keep me inside, I Googled “rain sports” hoping to discover some exhilarating game I had never heard of before. The search brought up some news headlines: rain postpones numerous Tuesday sporting events, rain washes out most of season-opening slate, rain plays havoc with junior golf. My closest positive hit came from a children’s website that suggested rainy-day activities like pingpong, Nerf basketball and Wii, none of which particularly fit the theme of outdoor recreation. So, I went back to my original plan: lower-foothill trail running between storms. There are inevitably going to be days in the spring when trail running isn’t appropriate. 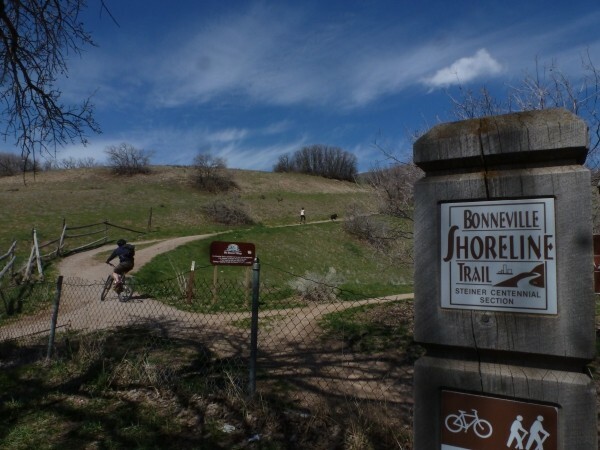 But, after the rain stops, I like to give a place like the Bonneville Shoreline Trail (BST) a try. This extensive trail system currently extends more than 100 miles. The entire trail runs a huge traverse along the valley’s benches, or foothills, the shoreline of the ancient Lake Bonneville. Being low-elevation, the trail is one of the first out of the snow. And, while its lack of dense or towering vegetation makes it a hot run in the summer, it makes for a relatively dry route in the spring. I hadn’t tried the BST since the snow dried up, so I decided to check it out. The dogs and I began our run at the Emigration Canyon Trailhead, across the street from the Hogle Zoo (2600 E. Sunnyside Ave.). I chose the quickly climbing trail on my left (when facing uphill), a straight shot up to the weave of rolling paths leading off to the west. To my surprise and delight, every inch was dry. The temperature for the day was topping out around 55 degrees, but by the time I had passed above This Is the Place Heritage Park and reached the gate dividing the Emigration section of the trail from the Research Park section, I was ready to take off my thermal layer. Where the fence crosses the BST, the trail crests a bit before flowing gently onward, downhill and to the north. From this point, the view out and across the valley is unobstructed by trees or telephone lines. The lake stands out, its massive presence felt suddenly and surprisingly. From up on the Bonneville Shoreline, it’s hard not to contemplate the serene waters, reflecting different shades at every hour and season. Down in the sinkhole of the city, one can forget about this aqueous presence and only be reminded of the proximity of its salty shores when a stray wind blows some stench eastward. The lake is beautiful, and great. Standing there in observance, I gave thanks for the opportunity to rise above the city and the daily, mundane worries it brings, and for the chance to contemplate something greater and more whole than myself. Taking another breath, I continued. The trail undulated gently and invitingly.